This is a form of notice for rent increase. Here the rent is being increased in accordance with tenancy agreement entered into by and between the landlord and tenant. The form is also available for download in PDF version from the link given below. 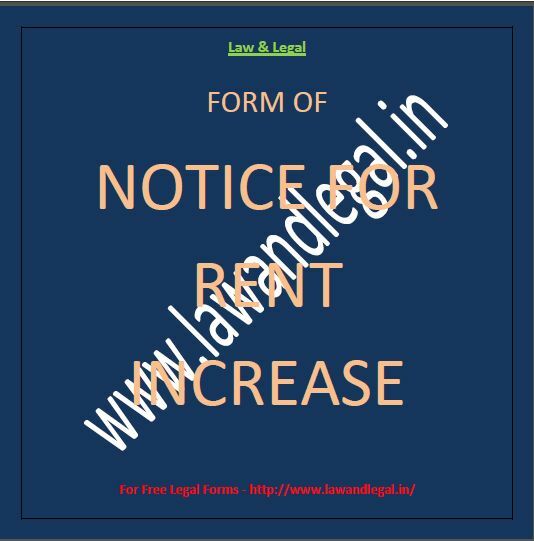 Sub: Notice for rent increase in terms of the Tenancy Agreement dated _______ (Agreement). Re: Tenancy in respect of one ________ unit being Room No. __ measuring about _______ sq. ft. on the _____ Floor at Premises ______ ____________________ (Tenanted Premises). 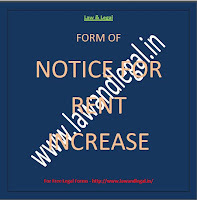 As set forth in the above referred Agreement dated ________, you are a monthly tenant in respect of the above referred Tenanted Premises at a monthly rental of Rs. ___/- (Rupees ________) only payable according to English Calendar month. In accordance with the said Agreement your monthly payable rent amount is being increased to ______ per month from _______ per month, effective__________. Please note that you are liable and responsible for making the rental payment at the enhanced rate henceforth. Great post, which everyone should be interested. I hope this blog was the most similar entries.